I picked this book up simply because of the title. Seriously. Before I even opened the book, I began to panic: could the promise of the title be yet another let down? Would I be reading about food trucks in New York or Miami? What good would that do me here in Los Angeles? I opened it up and was relieved to find that the book is broken up into regions of America. Los Angeles has its own little part in the West Coast chapter. I was saddened to see that only 16 pages of the book pertain to Angelenos. Fret not dear Readers, those 16 LA pages pack a lunch, er, punch. The author collaborated with a local foodie out of East Los Angeles. The book profiles a dozen Mexican food trucks…OG trucks; not just your average awesome taco either. We’re talking about dishes like: Cochinita Pibil, Papazules, Panuchos, Camarones Yucatán, Pork & black bean soup, Sikil’Pac, Mole (verde & rojo), Tlayudas, Pambazos, Huaraches, and Leche Quemada, just to name a few. 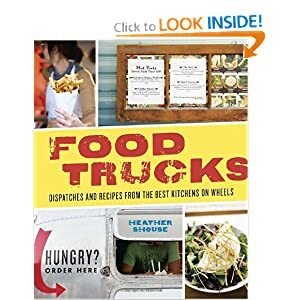 For those of you newly hip to the Gourmet Food Truck movement, the author includes a profile of Kogi, and running sidebars outlining other well-known gourmet food trucks and their Twitter handles. But this LA section is really about exploring the “ground zero” of LA food trucks. I flipped through the rest of the book, longing to visit every single city that was mentioned as a foodie truck destination. Those 16 pages gave my little foodie soul some hope, and fueled my appetite. My one criticism is that most of the Mexican food trucks are in the same area. Don’t get me wrong, some of my best meals have come out of ELA and the surrounding area. But sprawling LA has plenty more to offer. Perhaps we need an entire book devoted to Los Angeles. A quick note on cookbooks: Working in a book store for over 7 years, I’ve come across scores of books I’ve already read, and hundreds more that I want to read. Sadly, there just aren’t enough hours in the day. I’ve learned that I don’t have to read every flippin book that comes my way. Instead I read the first chapter. I try it on. If it fits I take it. If I’m unsure, I’ll read a second chapter. If the fit isn’t good for me, I chuck it and move on. Even though I get excited every time I crack open a new cook book, I find that this approach doesn’t work as well with recipe books. Reading a recipe and executing a recipe are beets of a different color. Instead I try a recipe or two…from the authors website. Hey, I’m not made outta money. All books are an investment, so why would I spend $40 on a book that I use as a shelter for dust bunnies? Try it out. A lot of your favorite celebrity chefs & cooking show personalities have their own websites. Before you commit to the book, take it out for a test drive. If the author/chef of a particular book doesn’t have a website, just Google their name. You might come across a piece written for a magazine or newspaper, or a Youtube clip of a morning show cooking segment. Cooking should be done out of enjoyment, and the last thing I want crowding my mind & dish is yet another unwanted expense.